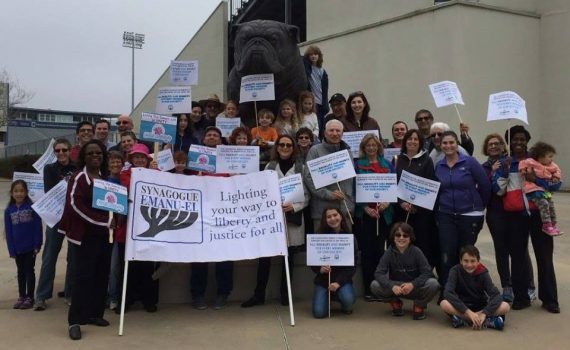 The Summerville Jewish Community will march in MLK Jr. parade along with Charleston Jewish Federation and other Jewish organizations. Mark yourself as Going on our Facebook event by clicking here. Join us as we march together and honor the visionary work of Martin Luther King, Jr. and support the Charleston YWCA ’s 46th Annual Federal Holiday Parade. Meet at Burke High School, 244 President St. at 10:30 am; parade begins at 11:00 am. We will share parade lineup # ahead of time. Jewish community organizations encouraged to bring banners and signs; CJF will have signs available as well. The parade will conclude at the corner of King St. and Calhoun St. Strollers, wagons, wheelchairs and walkers are not only welcomed but encouraged! Parade route is about 1.5 miles. Please contact RebeccaL@jewishcharleston.org with questions. Just as Rabbi Heschel marched with Dr. King, we walk in solidarity with the 30,000 celebrants who support the events throughout the Lowcountry.